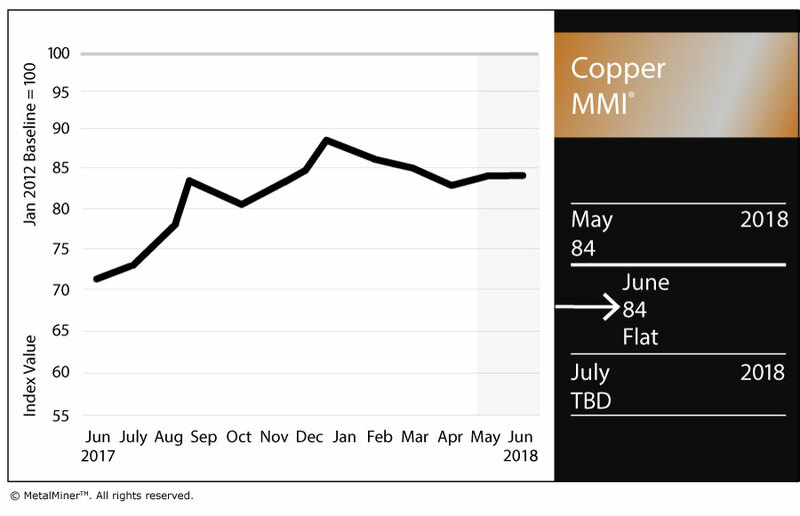 The Copper Monthly Metals Index (MMI) held steady in May at 84 points. The sideways trend came as a result of a combination of some elements of the metal basket increasing, such as LME copper, and others falling (such as scrap copper prices). LME copper prices increased during the first week of June. Copper prices now appear headed toward the $7,000/mt ceiling. Copper prices breached that ceiling several times in 2017-2018. LME copper prices have traded more sideways since the beginning of 2018, as copper prices took a backseat to aluminum and nickel. The Section 232 tariffs apply to both aluminum and nickel. The global copper industry faces closures and mine disruptions, which could affect copper supply. However, given stronger global copper demand, mines have also tried to increase copper capacity. 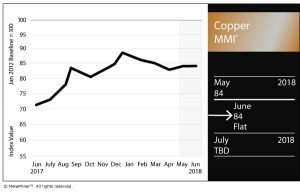 The supply and demand balance for copper calls for a slight surplus in 2018, but the forecast could change during this quarter. The Indian Vedanta mine closed permanently in May due to protests, lack of compliance with environmental laws and a shooting incident. Vedanta’s Sterlite Copper smelter is one of only two major copper smelters in India. Vedanta produces 400,000 tons of cathode copper per year. Plans to double capacity should have started after receipt of renewal consent. Rising capacity comes as a result of increased Indian copper consumption over the past few years. Current local demand growth is 7-8% yearly, positioning the country as a net copper importer at the end of the year. Meanwhile, to meet profit targets, Chilean copper mines need to run at full capacity. To achieve these objectives, copper output will likely increase. The Caserones copper mine could produce around 110,000 tons of copper concentrate this year to the end of March 2019. This equates to a 91,000-ton production increase from last year. However, current mine production levels suggest the mine is behind schedule due to technical problems. The Sierra Gorda Chilean mine is also suffering from technical challenges and running behind schedule. Since the announcement of the ban on copper scrap in China last summer, MetalMiner has followed Chinese copper scrap prices closely. LME copper prices and Chinese copper scrap prices tend to follow the same trend. Both appear to be in a long-term uptrend. However, scrap copper prices fell this month, while LME copper prices increased. Therefore, the spread between Chinese copper scrap prices and LME copper prices has widened. The wider the spread, the higher the copper scrap consumption and, therefore, the price. LME copper prices continued a recovery this month. Copper prices remain in a long-term uptrend. Therefore, buying organizations could expect further copper price increases. Buying organizations reading the Metal Monthly Outlook had the opportunity to identify the buying signal at the beginning of April and reduce price risk by purchasing some volume. For those who want to understand how to reduce risks, take a free trial now to the MetalMiner Monthly Outlook. LME copper rose 0.2% to $6,834/mt as of June 1. Chinese primary cash copper fell 1.8% to $8,010.95/mt. Chinese copper scrap fell 1.1% to $5,978.56/mt. U.S. copper producer Grades 110 and 122 held at $3.82/pound, while Grade 102 held at $4.01/pound.